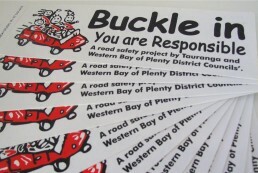 Our original ‘Buckle In, YOU are responsible’ campaign was a wide reaching multi-media campaign in the greater Bay of Plenty. 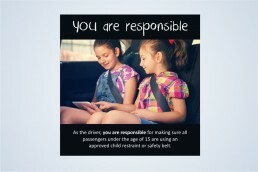 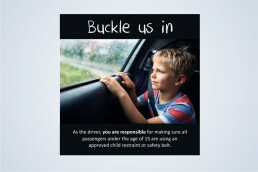 The simple and succinct message informed drivers of their responsibility; to make sure all passengers use an approved child restraint or safety belt. 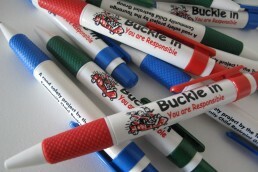 The campaign was delivered through a diverse range of advertising, print and promotional giveaways. 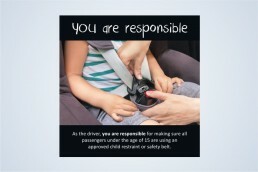 Plunket, in conjunction with Police and local authorities, continued to use BUCKLE IN for their Child Restraint Safety promotions, and ‘Car Seat Checks’, where car tidy bags were filled with goodies – all carrying the safety message. 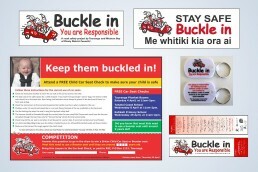 We have now added some new graphics which are also suitable for a wide range of digital and print media applications.